I always strive to get the best gear whatever game I play so I’ve done some research to see which weapons are the absolute best for every class. Here are my findings! Note: This list has weapons that require DLC content. If you want to see the list for the original game, check out this post. 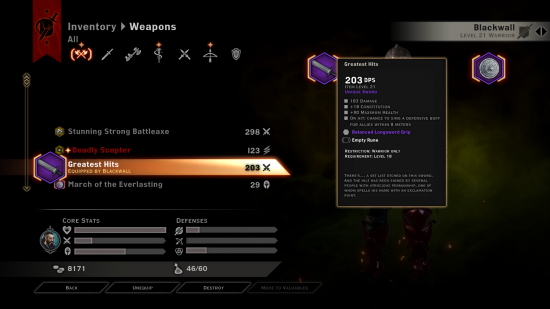 If you played the previous Dragon Age games, you may expect Unique purple weapons to be the best, but that is not the case. The best weapons in DA: I are crafted. Although there are plenty of powerful unique items, they pale in comparison to crafted gear. Unique weapons are certainly very good, but their relatively low item level and lack of customization makes crafted weapons superior at higher levels. Having said that, let’s take a look at the best weapons for each class, and how you can get them! The best bow is the Elgar’nan Enaste (schematic). 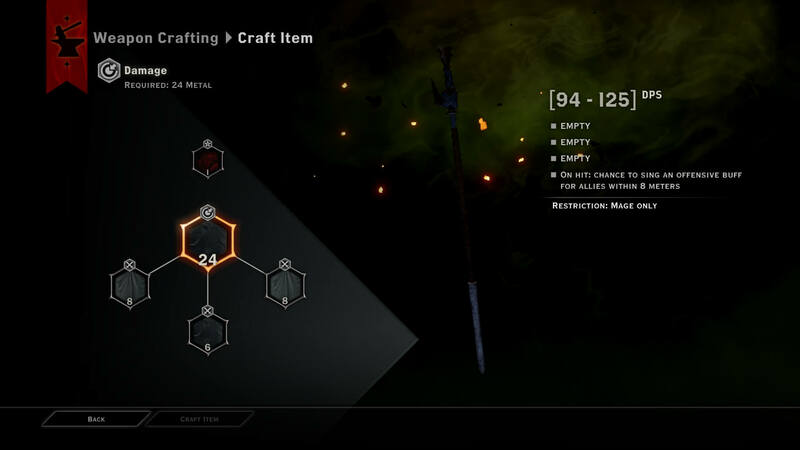 It uses 2 less crafting materials than Hakkon’s Wrath, but has a special effect that makes basic attacks do additional fire damage in a small area around your target. Keep in mind that to use this bow in the main game (and not just during Trespasser) you would need to find the schematic and use the Golden Nug to transfer it for your next playthrough (or alternatively, download a different person’s save file from nexusmods.com and then use the Golden Nug to make it available for your characters). Next Best Thing: Hakkon’s Wrath, crafted via schematic. This schematic can be found in the Old Temple in Frostback Basin by using a Veilfire torch to discover several hidden runes, during or after the “Ameridan’s End” quest. 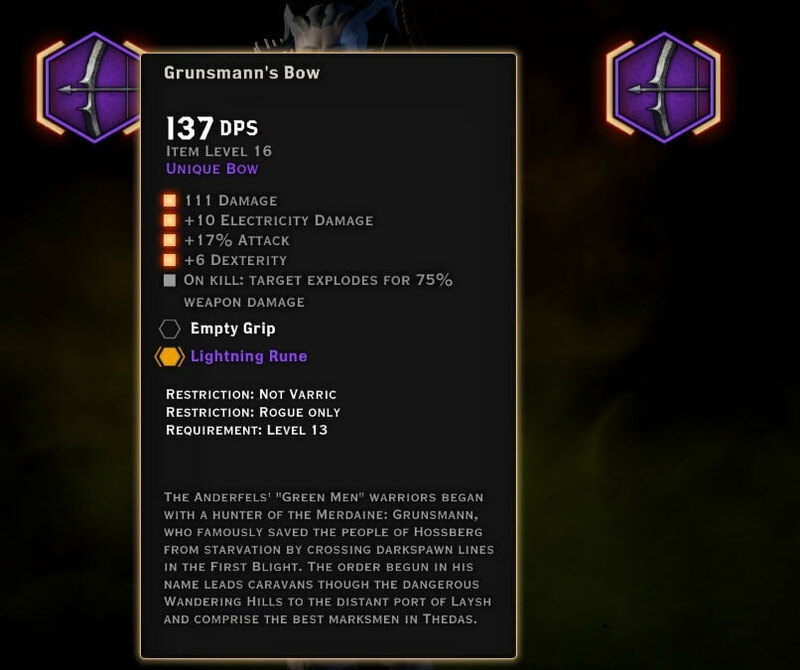 If you don’t have Jaws of Hakkon, you can always go for either the Bow of the Beresaad or the Grunnsmann’s Bow schematics; they are both sold for 12156 gold from the Black Emporium. As long as you use the best grip upgrade, they will be just as good. Grunnsmann’s is usually the better choice though, because you can stack a lot of critical chance or critical damage thanks to the 3 offense slots. For dual-wield rogues, the best dagger is the Stone Stalker Blade. This schematic requires the Descent DLC, and can be found as a random drop in the Deep Roads. Next best Thing: Blade of Red Birth, purchased from the Black Emporium with a price tag of 8478 gold. For mages, the Encore Schematic Staff is the best weapon , because in addition to decent stats and ugprade slots, it has a chance to cast one of 3 unique buffs for your entire party: Battle of the Bands, Mark of the Riff, and Sing-Along. Next Best Thing: the Staff of Corruption offers a good combination of high DPS, ideal slots (all 3 are offense) and the highest number of materials used. This staff can be purchased from the Black Emporium for 16956 gold. The best two-handed weapon is either the Chromatic Greatsword (schematic) or the Prismatic Greataxe (schematic). On paper the Greatsword is better because it has higher DPS and uses more crafting materials, but it has a 50% damage cap on basic attacks. I would say the sword is still better though, especially for Reaver warriors since they rely completely on skill damage (Dragon Rage and Devour) rather than basic attacks. In any case, the axe is much easier to obtain so you’ll be using it until you can get the sword. In order to use the sword you need to complete the Fireworks Mini-mage in the Trespasser DLC, and use the Golden Nug to make the schematic available for your next playthrough. Both the Prismatic/Chromatic axe/sword have a cool visual effect where the weapon blade doesn’t show until you use it. Next Best Thing: Axe of the Dragon Hunter (schematic) is the second-best two-hander. Unlike other high-level schematics, this one allows you to add a Haft and a Pommel to the crafted weapon, significantly increasing its stats. 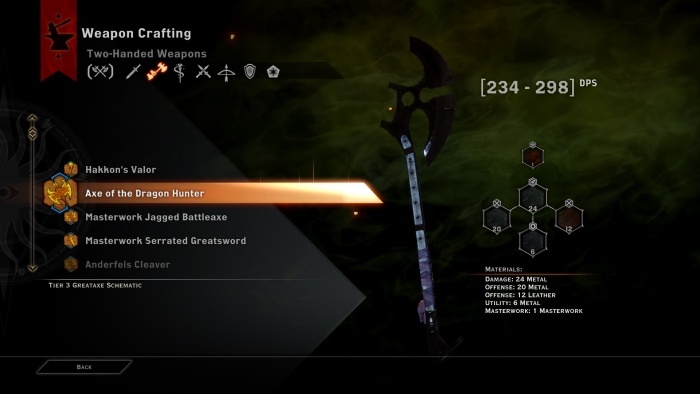 This axe can be bought from the Black Emporium for 15356 gold. Greatest Hits is the best tanking weapon in the game, thanks to its unique defensive buffs. Much like the Encore staff, it gives you a chance on hit to apply one of three buffs to you and nearby party members. The 3 defensive buffs are: A Little Knight Music, Fast Beat, and Bolstering Ballad. This unique sword requires the Trespasser DLC. Just make sure to get a +guard on hit masterwork somewhere else, since you can’t apply it to the sword. Next Best Thing: Truncheon of the Master is probably the next best alternative. The truncheon not only provides you with 31% stagger on attacks (31% chance to stun when you hit), but also an upgrade haft slot to further boost your stats, in addition to a special effect that makes your basic attacks briefly stun the target. This mace also requires Trespasser, and you need to have the new Trials options turned on to a have a chance to obtain this weapon as a Trials reward. For another option, there is the Valos Atredum sword found in the Deep Roads. This weapon actually has a built-in +5 guard masterwork. Meanwhile, the best non-DLC option is the Mortalitasi Firm Club schematic, bought from the Black Emporium for 6078 gold. 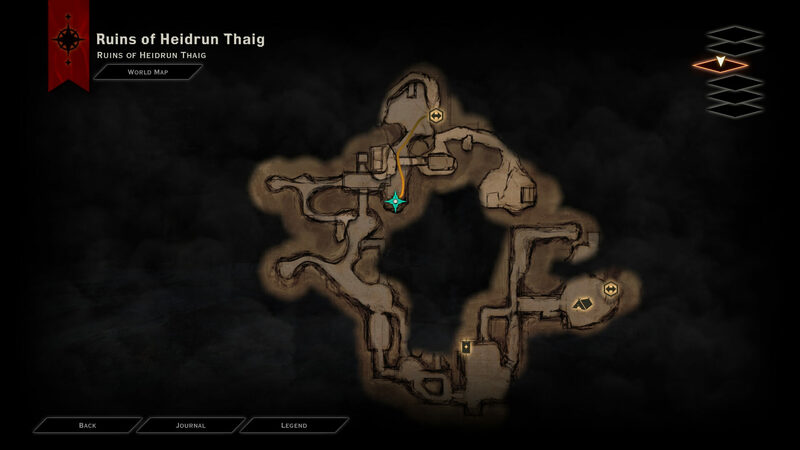 Location of the Valos Atredum unique sword – you have to jump down onto a hidden ledge and walk around the rock to find it. The Revered Defender Bulwark (schematic) is a new addition in ‘The Descent’ DLC and is currently the best available shield. This schematic can be found as random loot in the Deep Roads. Next Best Thing: Knight’s Second (schematic), random reward when you have Trials options turned on (requires Trespasser). After this, the Masterwork Grey Warden Shield, purchased in Frostback Basin’s Stone-Bear Hold. Finally for the standalone game your best best is the Shield of the Emperor. Use Tier 4 crafting materials (Dragon Bone, Dragon Scales, etc. ) for the highest stat numbers, ESPECIALLY for the Damage/Armor slot to get the highest possible DPS/Armor. If you run out, you can also purchase Tier 4 materials at the Black Emporium, in the Deep Roads, and some other locations. Choose the appropriate materials for your particular character. For example, if you are crafting a two-handed weapon, you will want to stack stats like + % attack, and the appropriate Masterwork. 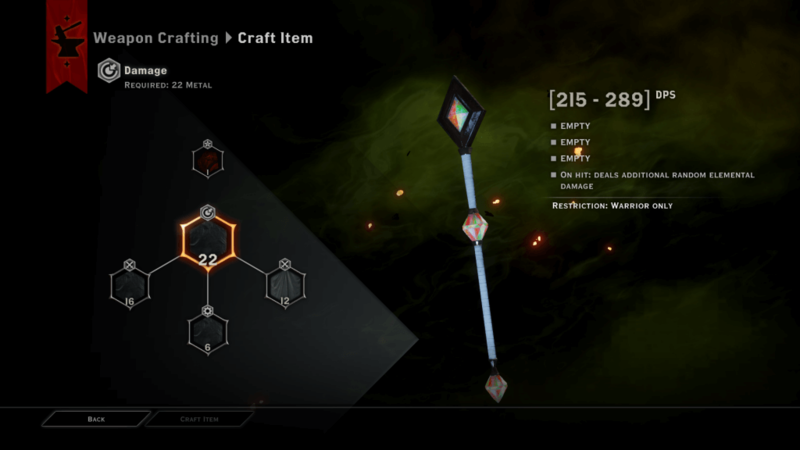 Extra crafting components like runes and weapon grips also have a tier system, so try to craft the best possible version to make your weapon even more powerful. Schematics for these are often sold by merchants or found in the game world. Runes give you even more customization and ways to make your crafted weapon better. This is an awful guide. About 75% of this is dead wrong. 2 handed warrior section is 100%wrong,literally blue weps on HW is better than chromatic. You can get silencer as dw rogue from ogre alpha in deep roads. Blade of red birth is maybe 10th best rogue dagger. Beresaad is maybe 8th best bow. Greatest hits and shield is the only area that is somewhat right strictly for tanking. There are plenty of other one handers that outperform them stat and dps wise though. Staff of corruption is absolutely awful…. Any blue lyrium staff in deep roads are superior. There is like 5 unique bows that out perform beresaad eith t4 craft. Truly just a crap guide. If im crafting Blade of Rebirth as an Assassin DW Rogue, what stats do I pick? So where would the Sulevin Blade schematic fall in then? Second best or not even that. It would be great, but it has no upgrade slots, so it doesn’t offer the stats that other 2 handers do. what about the Earnest Reprisal staff? Mages already only get two masterworks, so cutting it down to one is a huge blow. Also, the Staff of Corruption with T3 and T4 mats is better. I believe, after doing some calculations. The Coiled Strike Schematic (Which has a grip slot) is over the blade of red rebirth. If you are aiming for a Crit%+Att% build, Coiled strke (with the grip) gives around 30% crit chance and 12% att. 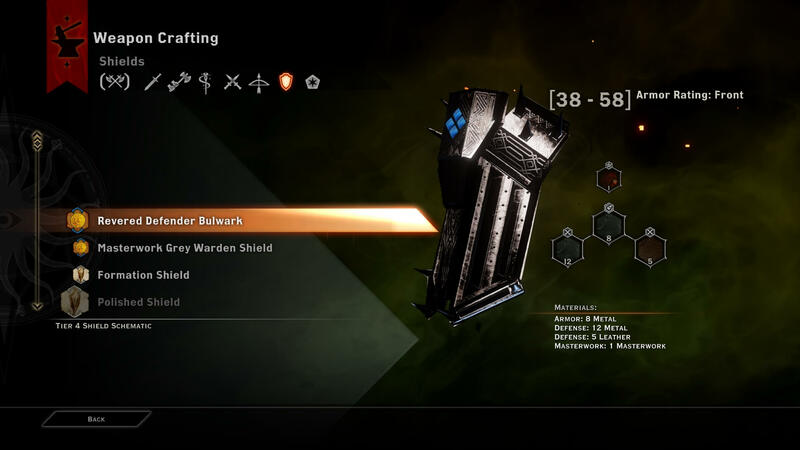 Wouldn’t Shield of the Emperor from the Black Emporium DLC top the Dwarven Proving Shield? Revisiting the bow issue, I think Elgar’nan Enaste will significantly outperform anything else on an AI character, at the very least. The AI will use basic attacks a lot, especially AI tempests during the flask of lightning phase. The Elgarnan Enaste will let AI-controlled Sera tear everything apart in the flask of lightning phase. The other discussion below already highlights the advantages of elemental-based attacks, and this applies to the Elgarnan Enaste as well, although only basic attacks proc the element damage. For human-controlled characters, I think Elgarnan Enaste is well worth it on a tempest, since tempests will be using basic attacks a lot more than other classes. There is one annoyance, though. The Elgarnan Enaste has a strange trajectory that is slower and shallower than other bows. This causes basic attacks to miss the target in some situations. For artificers needing crit to reduce cooldowns, Hakkon’s Wrath might still be worth it for the extra 12 leather Offense. The “next-best” is the Knight’s Second (http://dragonage.wikia.com/wiki/The_Knight%27s_Second_Schematic), not the Gray Warden shield. Knight’s second has a special ability, that negates an incoming melee hit every 30 seconds. I also believe that this special ability causes the opponent to be stunned, when the incoming damage is negated. I usually use this shield myself, but for aesthetic reasons. Thanks for the info, I tested out Enaste myself and the explosion effect is definitely worth losing a few stats. I think it’s best for any archer regardless of spec. Just another info about Elgar’nan Enaste: the explosion cannot be critical hit, but it seems to participate in Pinchusion build up. There is also a glitch, if you use Fade-Touched Hardened Gurn Hide (Damage) Masterwork with this schematic, then autoattacks hit three times alltogether. One normal hit, one 30% increased hit and the explosion in the end. If you have a rune installed, it hits three times, as well. Skills work normally though, this glitch appears only in auto attack. All three hits seems to affect Pinchusion (but runes do not). Good job documenting this. Basically, add a rune and you get 2x basic hit + 1x fire hit. This is a massive increase to the effectiveness of basic attacks. If the rune is a corrupting rune, I believe that one of the two basic attacks have the rune damage added, and the other does not. Just for clarification: if you have Fade-Touched Hardened Gurn Hide (Damage) Masterwork and also a working rune installed, there are 6 hits per shot. One normal, one 30% increased, one fire explosion, and also the rune three times. However rune hits do not add Pinchusion build up. So what are the best Haft and Pommel schematics for a DPS two-handed warrior? How about Greatest Hits for Tank Weapon? Hey great find, missed that one. By the way, the Stone Stalker Blade schematic is a random drop, so there’s no guarantee it’ll be found in the room you’ve marked. Did it drop randomly for you? On wiki it says it’s random, but I find that it is wrong a lot of the time. According to my experience, the best two handed weapon is Prismatic Greataxe. On paper it looks weaker than Chromatic Greatsword, or if you read the stats of a full built Axe of the Dragon Hunter, it is hard to think anything can beat that, but somehow Prismatic Greataxe wins here. According to my tests, chromatic does full elemental and half physical damage, but prismatic does full elemetal and full physical. And it has cloth offensive so you can put heal on kill in it, if you want to play trials solo. In total the Lightsaber does 1.5 normal damage. Vibroblade does 2.0, while Dragon Master Axe is 1 but factoring in haft and Pommel it should be higher. Lightsaber has 315 dps vs Vibroblade’s 289, which is 108% damage as well. If you’re a 2h champion, Axe of the Dragon Hunter is a clear winner as your survival depends on Walking Fortress. If you can spare the 14% Crit chance, Lightsaber is a good second. Even Templars might prefer Lightsaber to trigger Flow of Battle for more combos. The Vibroblade is probably more useful on all-out Dps character like the Reaver, but its worth noting that the lack of Crit Chance really hurts the weapon, although its granted that Reaver isn’t dependent on Flow of Battle. Recently did more tests on the Elemental 2H weapons. 1) The elemental attack is treated as a separate hit from the ‘base’ attack. RNG rolls for the elemental attack to crit as well. This has huge ramifications on the technical end of battles. 2) Since it’s considered a separate hit, Masterworks such as our favourite Hidden Blades +5 from Fade-Touched Plush Fustian Velvet gets more chances to trigger. Flow of Battle has TWO chances to trigger per hit, Hidden Blades gets two chances to trigger per hit. 3) The effect applies to Masterwork skills as well. 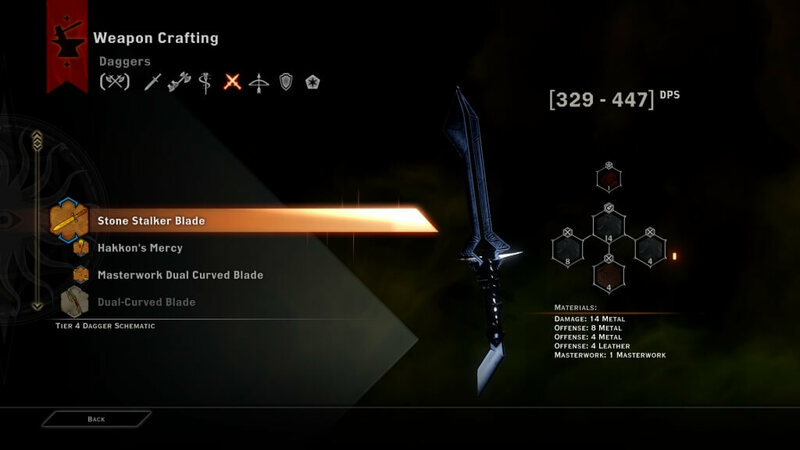 With either weapon equipped, Hidden Blades was hitting twice per strike. Now to some… details. After many days of experimentation, 2H Warriors, in my opinion, should go for the Prismatic Greatsword where possible. We’ve already established that Elemental Weapons > Axe of Dragon Hunter. 1) Reavers aren’t affected by the 50% modifier that the Greatsword has. If you’re not using Dragon Rage, you’re playing Reaver wrong. Higher DPS = Higher damage output. 2) Templars and Champions rely heavily on Flow of Battle to keep cooldowns low. Greatsword gives 21% Critical chance, and every attack has 2 chances of triggering Flow of Battle, so even if you lose the Haft/Grip bonuses, a Greatsword wielder is able to use his skills twice as often as a Greataxe wielder, for Templars and Champions, this is crucial for Walking Fortress and WoH/SP combos. I tried testing and it’s honestly really hard to tell if the crafted Chromatic Greatsword even has the 50% damage cap. And even if it is there, I’m not entirely sure what attacks it affects. The Wiki used to say the cap is only on basic attacks, but now it doesn’t say anything. I think it is indeed better than the Prismatic Axe. I was the one editing the Wiki, and I was asked by an admin to only present the information on the non-crafted page. I’ve tried explaining to the admin that no DAI player looks at non-crafted items for information, but she was adamant that the schematic entry should only contain information about the schematic, and she did have a point there, so it was removed. Regardless, as far as I can tell, no one has disputed my numbers as yet. My tests have shown that only standard basic attacks are affected by the 50% modifier to physical damage. Skills such as Whirlwind, Mighty Blow, Charging Bull… so on and so forth are not affected by the 50% modifier. They deal the full damage as listed on their skill tooltip, and that modifier is also applied to the elemental damage. For example, Whirlwind will deal 70% physical and 70% elemental per hit. There is a notable delay between the physical hit and the elemental hit, so if you kill an enemy with the physical blow, the elemental hit won’t even show. I believe that you’re finding it difficult to tell if the cap is there because of Critical Hits. Try removing your CHC/Cunning gear and lower your CHC as far as possible. You’ll start seeing the difference there. Thanks for the update! Considering that basic attacks are a relatively small contributor to overall damage I think it’s safe to say the sword is still superior in that case. At the very least, it’s certainly better than the axe if you’re playing a Reaver, since all Reavers should be doing is spamming Dragon Rage and Devour. There is another contender for best 1H weapon for tanking or just general 1H use. You get it (with Trespasser installed) by talking to Marylen the bard in Skyhold’s tavern, and completing the “Stop the Rumours” war table operation with Josephine or Leliana. It doesn’t have the Stun chance, but it boosts your max health a lot and it feels like I have constant defensive buffs up when I have Blackwall use it. The best -crafted- 1H weapon is the Revered Defender Longsword, I believe. – 2h: Chromatic Greatsword (Schematic) – The special ability about doubles your damage output, since the elemental attack always triggers on each hit, ignores armor, and doubles with your normal hit for even skill attack. – Bow: Elgar’nan Enaste (Schematic) is a contender, but depends on build. The effect of its special is similar to the Chromatic greatsword, except that it only works with basic attacks. I take back what I wrote about Elgar’nan Enaste being only a contender. I should have said that it the clear cut best, unless your build only uses skill attacks for some reason. The explosive arrows special trait doubles the damage output of basic attacks (including the rune damage). I think is the best staff in the game. High damage, many materials (with grip and blade), really useful buffs. I am already in Skyhold with it, in all trials nightmare solo mode (schematic is Golden Nugged from pervious game). Hmm that’s an interesting point, I haven’t considered the possibility of using the Golden Nug thing to get Trespasser loots. I’ll add a note about that somewhere, thanks. Is the stalker blade really the best since no upgrade slots? Stone Stalker has a top-end damage of 447, while the next highest dagger with an upgrade slot (Masterwork Dual Curved Blade’s) is 341. IMO that more than makes up for the lack of upgrade slots. 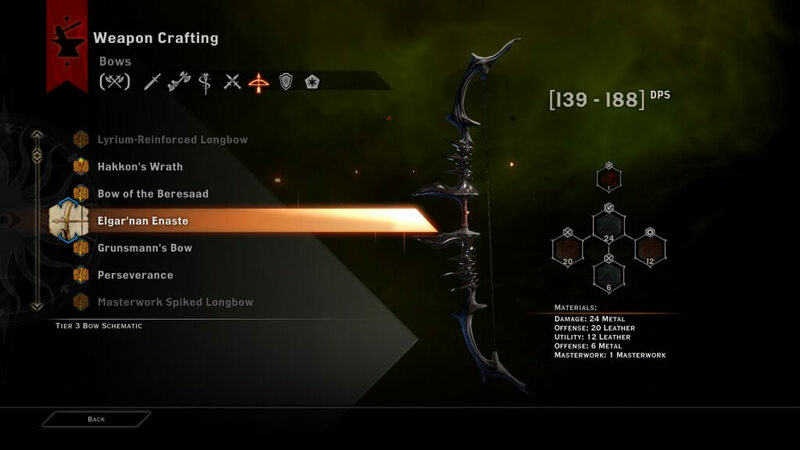 What’s the best bow in the game, without any DLC? what stats should I build onto my one handed for my champion! ? Sorry for late reply. Stack constitution (more health and melee defense), magic and melee defense (less damage taken from dangerous spellcasters and powerful physical enemies like Pride Demons), and stagger on hit (least desirable stat, but if you have offensive crafting slots, this is the best choice). Wrath of lovias is the best staff for offense/ knight enchanter mages. Because pf it’s 3 leather offense slots it can reach nearly 40% crit chance, and has a rune slot/grip slot/ blade slot for crit damage. I must disagree with Hakkon’s Wisdom being a better staff than, say, the Masterwork Enchanter Staff. Yes, the former has slightly higher base damage (125 max vs 115 max), but it only uses 9/8/6 offense materials in its secondary slots. The Staff of Corruption, which you mentioned, makes up for its lack of upgrades with 20/12/6, while the Masterwork Enchanter Staff uses 8/8/6 and still has room for a grip and a blade. Hmm you’re right, I’ll change that. The staves in general are really close because the older schematics have grip/blade slots and the new ones don’t. While the Crit % is nice, the pure damage from Attack % almost always out-damages every other stat for mages with the exception of flanking dmg, but that is situational. While crit chance should not be ignored, Staff of corruption gives you some crit chance, while still offering massive amounts of attack %. Think of it this way, I generally am always able to to cast a damage spell when i have the mana (I use flashpoint + clean burn with staff of corruption), so cooldowns are not inhibiting my damage as much as the ceiling for staff damage is. Attack % is the most efficient way to increase damage across the board for mages. GhoXen did a lot of work in analyzing the efficiency of stats on this forum post. I found this incredibly helpful. I also did some damage calculations and staff of corruption comes out ahead of any other staff by a good margin. It seems those weapons that have attachments available are generally better than the rune-only ones. Obviously Axe of the Dragon Hunter is bugged. And I believe the best weapon now is depends on the specialization. As an assassin, you basically need critical damage over everything. Grunsmann’s Bow Schematic offers 8+6+6 offense leather slot, the Masterwork Bound longbow grip seems to be best one with 14 metal+6 leather, however Engraved Longbow Grip has 12+6 offense cloth which appears to be the worst grip but if you put Dragon Web in it, you could have a weapon that provide 123% Critical Damage in total. I don’t have the Hakkon DLC though. Just my tow cents. Fair points, I didn’t consider how different specs may want different offensive stats. In terms of attachments, most of the hakkon and emporium stuff doesn’t have attachments, but it’s still superior to existing T3 gear. Im going to update the post, thanks! Axe of the Dragon Hunter is the best 2H weapon, but only because it’s bugged. Currently you are able to put a haft and pommel into it even though it’s supposed to be a rune-only weapon. If you don’t want to abuse a bug, then Sulevin Blade is the best. Also, Bow of the Beresaad is slightly better than Perseverance if you have the Masterwork Bound Longbow Grip schematic.